« Time to begin research! Wow. I just came across the finest list of street artists on the Brooklyn Street Art blog. This will be tremendously useful in identifying these li’l pranksters. I saw Anera on there with a direct link to endlesslove.com, though no other mention of Anera once I got there. When I looked up “Anera” on Google, I found ANERA (American Near East Refugee Aid). 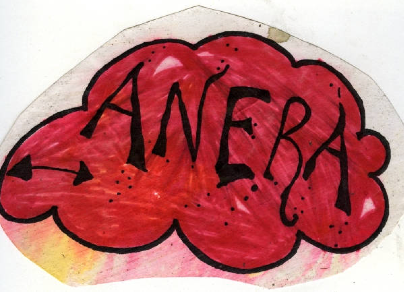 Just tried “Anera sticker” and found something called Stickerthrow! 2004 with Anera listed as one of the artists, tho no other link to this sticker artist. This is the sticker I found in NYC, November 2004.
thanks for the shout out…i hit nyc in 2001 and currated spit/swap at clayton patterson’s space and then currated stickerthrow with abe lincoln jr. soon after he and i formed elc and through its many incarnations i have taken a more sidelines role. about 4 years ago i became a teacher in the nyc school system and since an arrest during my second year have been less and less active in the streets. a recent arrest in october with public ad campaign pretty much put the nail in the coffin. i still love the streets and being a vandal but……. AnerA came about from my love of palindromes….